Is of Maori descent from the Eastern part of the North Island of Aotearoa / New Zealand. 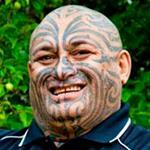 He is a very patient and highly-qualified teacher of Maori tikanga (customs) and has taught many a TIME Unlimited Tours guest the famous Haka Maori war dance during our Marae stays. 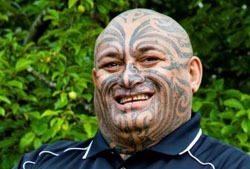 He also functions as cultural advisor for our company and is often called upon to play a major part in Maori powhiri (welcoming ceremony) for dignitaries and other guests on our tours or other functions.